Schools are not a place to figure out all national problems, but pledge future betterment of a nation. Thus, schools play essential roles in building characters of a nation. However, cheating is often found at schools, even at primary schools. The issue underlay Drs. Ichsan, M.Pd. to conduct research on ‘Education of Trustworthiness Values for Pupils Based on Classes and School Culture at MIN Jejeran Bantul Yogyakarta. At his dissertation defense on 13 September, Ichsan mentioned several reasons why pupils cheat as they possessed low morality, they had low academic achievements, no one knew that they were cheating, teachers manipulate scores, and rules and regulations created school structure and culture. Therefore, eradicating cheating habit needs character building focusing on honesty. “Cheating is a dark side of pupils’ life,” declared Ichsan. According to data of Ministry of Education, characteristics of honesty values for primary school are divided into two indicators based on efforts to be trusted in words, actions, and work. First, pupils of grade 1-3 tend to avoid cheating during exams, do not do homework at class, answer their teacher’s questions based on their knowledge, are willing to tell their difficulty in making friends, talk about an event they know, and state their inconvenient learning atmosphere at class. Second, pupils of grade 4-6 do not cheat their friend’s homework, tell their experiences, express their difficulty in accepting other opinions, give ideas of what they believe, and say their learning inconvenience. 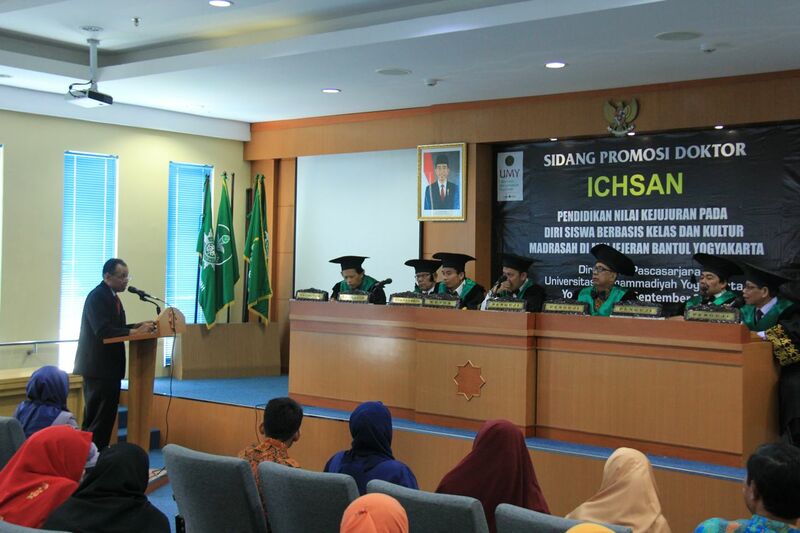 Additionally, Ichsan was the 47th graduate of Doctoral Program of Psychology of Islamic Education of UMY. His dissertation defense examiners were Sri Atmaja P. Rosyidi, M.Sc.Eng., PhD., Dr. Aris Fauzan. M.A., Prof. Dr. H. Sutrisno. M.Ag., Prof. Drs. H. Sarbiran, M.Ed, Ph.D., Prof. Dr. Anik Ghufron, M.Pd., Dr. Abd. Madjid, M.Ag., Dr. Muh. Samsuddi, M.Pd., and Dr. H. Moh. Anies, M.A.